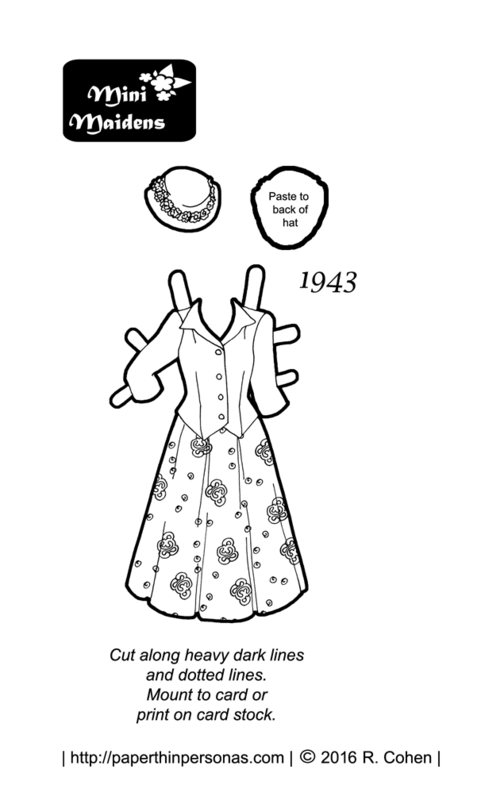 Today’s dress for our 1940s printable paper doll is from another pattern cover. It is based on a Hollywood pattern from 1943. One of the things I liked about this dress was the two ways it was styled. In one option, it almost feels like a suit and in the other it is clearly a house dress. Just like today, people liked versatility in their sewing patterns. Despite appearances, this dress is really made in one piece. Similiar styles are this 1944 Dubarry design, this 1942 Hollywood desig and this 1945 Simplicity version. The pattern on the dress’s skirt is based on the fabric of this dress from 1942. It’s another example of the “two piece, but not really” dress style and I loved the fabric print which I simplified extensively to make into a paper doll version. Be sure to read the whole blog post, it’s totally fascinating. Her hat is based on the hat worn by the fashion figure on the pattern cover, but small hats like this, sometimes called “doll hats”, were very popular. Here’s an example from 1940 and another example from 1940. I did my best to capture the look in a way that I still thought would stay on the paper doll’s head. If you’re in need of a 1940s printable paper doll to wear this lovely 1943 dress, you can pick up Hazel in all her 1940’s printable paper doll glory from Monday’s post. So, is anyone planning on coloring today’s paper doll dress? What colors would you use? I’ve been thinking rust and navy, but that’s just me. Other people’s thoughts? Leave a comment and let me know. Love it, it’s like something straight out of “Agent Carter”! Thanks for always having links that inspired the gown in your post. That article about the dress was so interesting. It makes me love todays dress even more.